Hello! 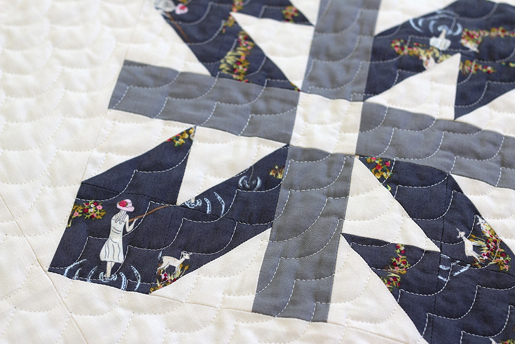 I’m excited to be back here on WeAllSew today, this time with a quilt-along! When I designed this quilt, it was one of those rare but wonderful instances when I felt like the design meshed perfectly with the fabric line I wanted to use. 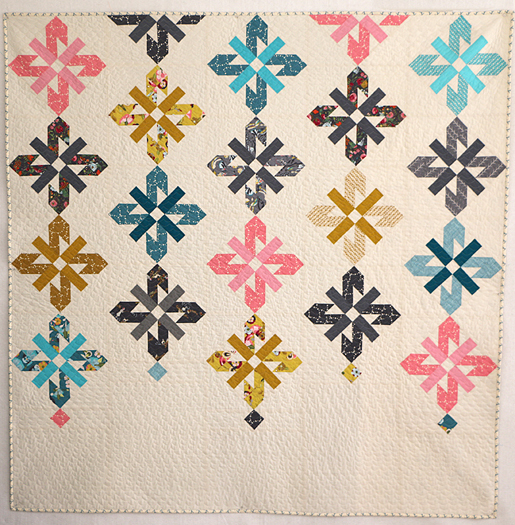 I’m using the Emmy Grace line by Bari J., from Art Gallery Fabrics, and I think this modern twist on a traditional quilt block suits Bari’s vintage aesthetic nicely! 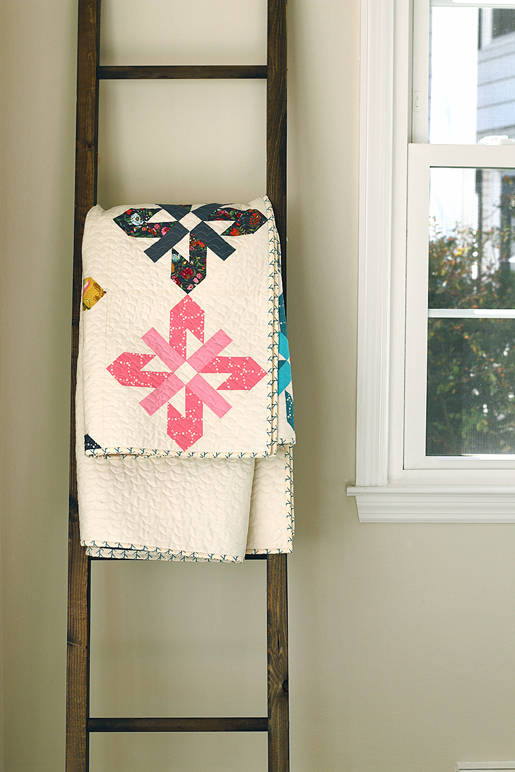 And before you ask about the difficulty level—this quilt is much easier than it looks. I’m using the square-in-a-square structure to avoid setting the blocks on point. Square-in-squares can be finicky, but I’ve got some tips that I think will help you get these blocks just right. And even if there are a few that are a tiny bit off, the way the blocks are laid out is actually quite forgiving. You only have to match points at the tops and bottoms of the blocks—it’s not quite so crucial on the sides. So I think you’ll get great results either way. I’ve got a fun, easy way to get the scallop quilting you see here, using a decorative stitch on your machine and the walking foot or even-feed foot. 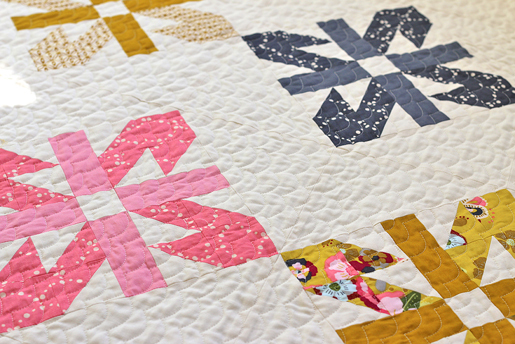 If you can straight-line quilt, you can do this scallop quilting! In addition to the Emmy Grace fabric line, I used an off-white background solid, and coordinating colored solids in the blocks. (I used Kona Cotton in Bone for the background, and the following Kona colors coordinate well with Emmy Grace—Graphite, Pewter, Coal, Steel, Bubble Gum, Breakers, Glacier, Everglade, Citrus, and Yarrow). Cut an additional 5 squares, 2-1/4″ x 2-1/4″ from 5 different prints. These will be used for the diamonds at the end of each row of blocks, which we will make in Week 3. Enjoy your cutting, and I’ll see you back here next Monday for the next installment–making the blocks! If you’re on Instagram, I would love to see your progress! Hashtag #chandelierquiltalong and #berninausa so we can all share with each other! You can also tag me at @freshlypieced. Next Next post: BERNINA (and Schnauzer) Birthday Cake! I may have missed it, but can you give me the finished deminsions of this quilt? Thanks. This looks like something I would love to do! I don’t see the finished dimensions of the quilt either in this post or in the pdf – how big is it? Hi Lee! I’m excited to get started on this beautiful quilt. What will the finished dimensions be? The size of the quilt is under the picture of the quilt where all the information to make the quilt. Hi Lee! Hoping to make a Christmas quilt from this QAL, it’s the perfect pattern! I may have missed it, but what size is the finished quilt?